One of the hardest parts of start out into full or part time web design is setting fair prices. It’s a topic that we’ve tackled before in our week-long Pricing Bootcamp series. Since then, we’ve received a lot of email asking the same question. 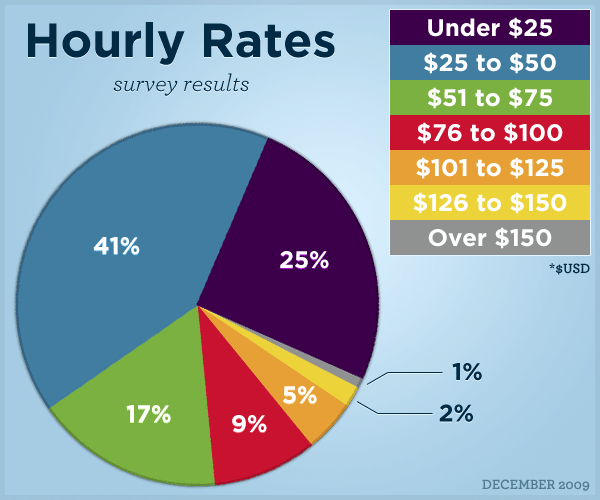 We decided to revisit the pricing discussion with a survey on hourly rates. This survey kept things simple by only including two fields: one for the hourly rate, and another for additional comments. In the interest of a global economy, I did not ask for location or nationality. In today’s web industry, a firm miles away in Germany can be just as competitive as the one next door. Thanks to the 107 readers who took time to respond (original survey live on Google Docs). All respondents were asked to submit their rates in $USD for consistency. The charts below break down the responses into seven price brackets. Please keep in mind that this was an informal survey, and the results shouldn’t be considered definitive. The most valuable information to take from this survey? An idea of what not to charge. Assuming you have the skills required, charging less than $20/hour for your services is not as competitive as it may appear. In order to compete with the professionals, a rate starting at $50 would be better. For the largest price bracket ($25 to $50), the average rate was $35. Many of the designers priced below $25 also commented that they were either students or in a country where dollar value was strong. It’s also important to keep in mind that while this survey has trends, it only asked for a price: not specialized skills or quality. I suspect that many designers have not yet settled on a solid hourly rate, and charge lower than they reasonably should in order to be safe. Estimating a project price using your hourly rate is good for estimates, but be careful not to underestimate the work involved. The longer you spend on a project, the lower your hourly value becomes. It’s concerning when a client asks for hourly rates but not estimated time. As we’ve said before, efficiency shouldn’t be punished by a low hourly rate. Clients can be treated well without a bargain price. Low prices prevent growth and invite lower grades of clients. Price like you’re worth it. Scope creep is a terrible thing. Communicate project goals before agreeing to lock in a price. I’ve created a second survey (including location) on Google Docs to continue this conversation. Results are public (see spreadsheet) and hopefully as more people read this post, the responses will give a solid second opinion. Interested to see responses? Take the follow up survey now. Now it’s time to hear from you. What points do you consider when determining hourly rates? Do certain situations affect your rate, or is it constant? What’s a reasonable rate for your location? Leave your response below. A very useful article, wish something like this had have been around when I was looking to start freelancing. I’m in the $25-$50 per hour range. Very insightful post. It’s good to get a look at what the other designers are charging for their services. Also, it’s really smart how you included the additional factors, as most people don’t factor that in. Thanks for the results on this! Id be curious to see the results of some other polls related to the design industry, perhaps SEO/User Experience/Video production. Very nice post, thank you for sharing. Pricing can be a tricky thing sometimes. Before I send them an estimate, I ask, “Do you think you’ll probably like the design I show you, or do you think you’ll have a lots of comments?” People usually answer honestly and it usually gives me a good idea of what to expect. I also build in 2 design revisions, and price additional ones in the contract. So they know exactly what to expect when they come to me with 100 changes…. I think Leah’s hit the nail on the head as you never know whether you’ll get it right the first time or if there’ll be a dozen revisions before it’s completed. Interesting that you build in two revisions, is that something you quote to your clients and if so, does that encourage them to ask for more changes? Wish I’d known this before hiring a guy to set up photography website. He charged me while he was researching how to do the work (he’d assured me he already knew how to do). In the end, the website looked amateurish and ineffective and was not what I requested (and cost me a small fortune). It was like throwing money out the window! Now I have to pay someone to completely redo it. as a web-designer myself, I’m very sad to hear of bad experiences. It is hard to understand why people don’t work professionally! Its very important to research the people you are interested in using. As a web design company who delivers excellent services, we ourselves promote this as we have no skeletons in the closet and welcome reassurance to our clients. There are many web design directories with reviews which should help you choose the right company. Dont use substandard companies outside of your country, keep it local. Nice article ;) Yes, they are right, Pricing can be a tricky thing sometimes. 25$/hour, as I’m not very experienced just yet. Rates will go up once I have a broader portfolio though. Good post! This article is very insightfull, thanks for this. Very, very good read, not only for web designers but for seo freelancers like myself, or freelancers in general. You want to get the client but you don’t want to undercut yourself to much. Very thin line, but with more experience, better results and client testimonials we all should eventually be able to charge what is fair but also makes us happy. If the average hourly rate is $25 – $50 then people are seriously undervaluing their skills. By charging enough you actually doing your client a huge favor. How? By staying in business. People who hire us need us to be available in the future. If we sabotage our own success and change careers thats bad for them. I recommend the pricing section of “The Principles of Successful Freelancing” by Miles Burke (Sitepoint). Adobe Creative Suite, a new computer of three years, ongoing training, health insurance, sick and vacation time. Factor that stuff in and you will be surprised what you need to charge hourly to stay in business. Yes its over $50 an hour. Any less and your either living in India or your moms basement. Wow, these numbers are a lot lower than I expected. 2/3 of the respondents are under $50. If you’re freelancing full time in the US you would be living pretty close to the edge on $50/hr. $50 may seem like a lot but like Tai says once you factor in expenses, taxes, health insurance and the fact that it’s near impossible to bill 40 hours a week without working 60-70 hours that hourly rate gets spent quick. I think an important factor left out of the survey is the skill set and services that are being offered. Someone who knows a little html and uses a WYSIWYG web builder should not be charging the same as one develops and codes custom web applications and knows more acronyms than I can count. The price war has really messed up pricing in general for designers and developers. It kills me to see that developers in India are charging $10.00 an hour, only to have clients come back to us and beg for our help. I agree with Ross above, that if you are a good designer/developer you should charge accordingly. We are starting to dabble in the iphone/android development and our hourly mobile dev rate will be $ 150.00 given the fact that there are not many of these developers are not available. All in the all, the old saying applies “YOU REALLY GET WHAT YOU PAY FOR”! This is a good discussion that all freelancers need to sit down and have with themselves at one point or another, and I have to agree with everything you’ve said here. I’ll share this on my blog as well, thanks! I wonder sometimes how easy it is ot stick to an hourly rate. I guess it takes a long time to get used to planning what is required per job. I almost always charge by the job and make sure it is proffitable. It normally comes to the £70 mark. I also have clients who pay me a lot less, but these clients have me on a retainer and I spend a day with them once per week and some once per month etc. The rate I charge for that can be as little as £20 per hour but its a full days work. It is however regular income and gives me a base earning for the month before I begin any new web and print work. So I’m curious if anyone has any addon fees such as rush fees or holiday work. I often have clients who need small things done, and need them RIGHT NOW, and have to work my whole day around to fit them in. excellent and useful article. thanks for posting. This is a great poll, thanks for including it. I’m still in the $25-$50 range, unless I’m doing more development/coding style work, but I also focus on clients with start-up business and smaller projects so I can take on more at a time. The problem with this however is that most start-ups don’t understand the real cost of web design services, and I’ve often been told that even something as low as $25 is expensive and unreasonable! When you say Web Design, does this mean Design + CSS? or the Front-end PSD file only? I usually charge around $85. That includes all design and build work, numerous (but reasonable) revisions and 3 months worth of free advice/help and updating. I havent changed my rate in years and dont see the need to for at least another 12 months. Amber: I hope your clients dont find your post. I cant think I would be too happy to find you adding several hours to work I contracted you to do. Thats just bad business. Excellent post. I work with a partner to design and code sites (we’re both college students majoring in business) and we’ve been struggling to find a good price. We’re charging $20/hr for our current project. All this information tells me that we’re on the right track. Thanks! I started out at $45h. As I got busier I would raise my rates for new clients. I raised rates on older clients eventually. It’s always good to send current clients a note in Sept that rates will increase next year. You may find they will throw you a bunch of work before the new rate sets in. When times are good, raise rates!!! I charge $250+/hr + quote/meeting charges, not sure how people are charging ~$45/hr… they are rather students, have a low quality of work or dont know how to sell themselves as a professional designer. If time is money you’ve made me a waetlehir woman. I charge $80/hr and I find it’s the perfect rate at the moment for attracting the kind of business I want while keeping the ‘cheapskates’ away. It’s important for creatives to know you’re not charging solely based on your skill set but also your experience and insight. hi to all i’m currently working on a per project basis how much will i charge per hour if i switch to freelance, here’s my portfolio: http://twitpic.com/photos/herosuke Thanks! happy 2010! This article can be very useful but you have to think about one important thing: Most of the readers who change their rates because of this articles are new in this business. imo it’s wrong to suggest they should charge ~50$ unless they have a very good educational background (related to web design). I held hourly rates for about 2 months. I found a lot of my walk-in clients didn’t like it. They wanted a flat rate and a very defined description of what that flat rate included. So I moved to an ala carte menu style of pricing. I found that clients liked being able to pick and chose what technologies were included in the design. Love the article sir. This is something that is always tough to gauge. I found a price of 75/hr billed in increments of 15 minutes is just right. Payment options and others also helps sweeten the deal. I dont think one can live correctly charging less than $50/h when in the US or UE..
As for myself, I charge $25/h because I can, since this is quite some cash in the country I am living. And I am busy outsourcung for US/EU agencies. Still, I suppose those agencies do charges at least 3 times this price to the final client !! A mechanic charges at least $80 an hour and most of them didn’t even finish high school, stop slutting yourselves out so cheaply. I just think you’re lucky you live in US, that’s all.. I’d be really happy if I’d get 30$/h. By the way, I live in central Europe, not in India. such articles are not oft seen but I find it good to see more and more. Thanks so much for posting those survey results. Articles are everywhere telling you what to base your rates on, but it’s so rare to see actual numbers, instead of vague concepts on which to base your own. It’s hugely valuable information! Ooops,it would appear that I have been over charging everyone. 100 hr is standard if you have at least 5 years under your belt. You guys are selling yourselves (and everyone else in the field) short. I’m not sure if this blog attracts younger designers, and this is the reason, but it’s really dissapointing to see people charging these low rates. But due to variations in global eccomonies location is important because $25 is worth A LOT more in “developing countries” compared to the USA. So these designers/developers can charge under $25 per hour and still be making decent money. Whether they’re skilled is another matter. Having said that, after reading the comments it appears the majority of readers (and possibly survey participants) are not from such locations anyway. Although we’ll never be able tell. Excellent article and lots of wonderful contribution. I basically think what you charge is based on your economy. Maybe it’s possible for people in the states to charge $100 – $150/hr but over here (Ghana, Africa) you will never get a job with that kind of rate. With that said, I charge between $35 – $50 because of my skills and experience. Others charge as low as $5/hr. But that doesn’t mean I should reduce my cost, it’s all about knowing what your worth is, sticking to it and making sure you deliever everytime. At the end of the day, a client wants their money’s worth. insightful post. It’s good to get a look at what the other designers are charging for their services. I am charging 35$ per hour for UI design and development. I charge $75/hour to cover all of the administrative costs associated with the project, i.e. meetings, commute, phone calls etc. Clients don’t like to be billed for these additional costs but in reality freelance business needs to account for those since a lot of the work goes into administration. I only charge them for design work but my fee has built in cushion to cover my time and expenses. My partner and i enjoyed your own report. I just moved to the US, and this is soooo useful!!! I’ve been struggling with this issue in my own country as well. I can suggest taking in consideration what other services charge for an hour. Let’s say a haircut in your country is 25$. You don’t want to be charging the same as a hairdresser. No offense to the hairdresser, but your education was more complex, expensive, and takes more responsibility for sure. You are branding a company (may be with a banner, a logo, website, etc), and you are providing higher value to it, or to a product. We are value generators, so we should be valuable ourselves, right? This should not be so hard for us, but it is. I’m sorry we don’t learn about this in college (at least where I come from). I most appreciated the insight about “Scope Creep”. On one of my first web projects, I didn’t account for this. The project ended up taking about twice as long as it should have. Sure, it was my client’s that continued to change their minds relentlessly about pages, content, colors, templates etc., but it was my fault for not having a line item check list and payment schedule in place. This schedule is now my best friend when building a new site for a client. Oh, and my hourly rate is $85 for a site build. However, I estimate this and then give my client a project cost that doesnt include my hourly rate but rather a project cost instead. This helps avoid any “rate comparisons”, especially by someone who has input on the project. life looks years younger than she actually is. Look at Diane Keaton, born in January 5, 1946 which makes her almost 60 years old. She certainly doesn’t look her age. lifetime guarentee. Face it—this is THE bag!.